This handcrafted porcelain doll is part of Schneider's European Folklore Collection. Schneider has been producing handmade dolls in Germany since 1934. 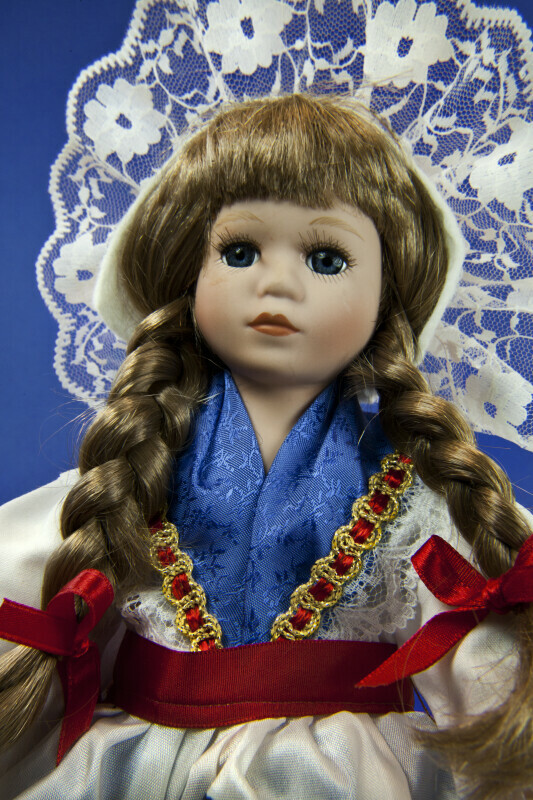 This female doll is wearing the national costume for Luxembourg -- a white hat with lace trim and a blue dirndl. Her apron has the coat of arms from Luxembourg painted on the front. She is wearing white pantaloons and black shoes. Certificate: "This exclusive doll has been designed by Walter Schneider GmbH & Co, KG for the discerning collector. We guarantee herewith the authenticity and high quality of the doll. Each detail has been hand-crafted by skilled artisans." The figure stands 12 inches (30 cm) tall.